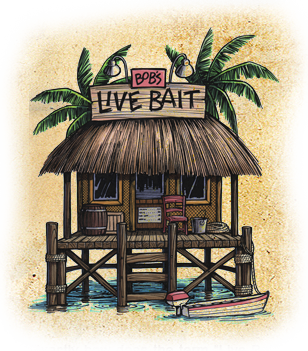 Exactly how does the term “Live Bait” apply to a Marketing Services and Fulfillment company? No, we don’t sell night crawlers or blood worms. Instead, my theory is that all marketing is merely a conversation between vendor and client. Since many conversations begin awkwardly, “Live Bait” provides a quick jump-start. It’s a little bit like starting a conversation at a bar. What doesn’t work: “Hello, gorgeous. What’s your sign?” Nope. Instead, my business card says: “Live Bait,” and a real conversation is off and running. You cannot believe the number of people who NEED to know if we really have bait in the warehouse or not! Instead, I have a perfect opportunity to switch topics, tell them about Roberts Company, what we do, and why our company is so great. It never fails. So...when you’re fishing for a Marketing Services and Fulfillment company, don’t settle for salmon eggs and stinky cheese. Go for the real thing by using Live Bait ... Roberts Company, that is!